The Blue Mountain Log Company can solve all your custom home building needs. 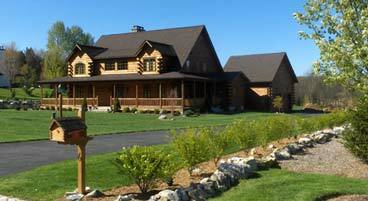 Serving Northwest New Jersey and all surrounding areas, we specialize in the construction of log homes and can provide you with quality, professional service at a low price. We have experienced building crews at your service with the willingness to cater to any specifications you wish to incorporate in your log home. You can build the custom house of your dreams with our expertise. In addition, we are happy to help with suggestions and leverage our extensive experience to help you make the most out of your building experience. The Blue Mountain Log Company is a customer service orientated business and we bring our best work to your job for every step of the process. You can expect precision, high-quality work at all times and rely on our one hundred percent commitment to detail. Our main goal is to make you, the home owner, completely satisfied. After all, this is your home and you deserve the best. Price quotes are gladly given and references are avaiable. So what are you waiting for? Call us today at (908) 229-2783, to start building! We are a fully insured building company with provisions for general contracting that is recognized by the New Jersey Builders Association. Our New Jersey Builders License number is #030365.